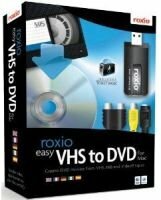 Roxio Easy VHS to DVD for Mac lets you easily capture video from your VCR or analog camcorder, to preserve your memories for generations to come. Burn captured videos to VCD, SVCD or DVD with professionally designed menu styles. Import into iMovie to add effects, titles, transitions and edit your video. Transfer your videos to an iPod, iPhone or other device; post on YouTube or your favourite social networking sites. I have installed and tested this product on multiple macs. It does not pick up the video feed. Even after installing software updates from the roxio website, the app crashes.